What Is The Scheduled Service Capacity on Queen Street? 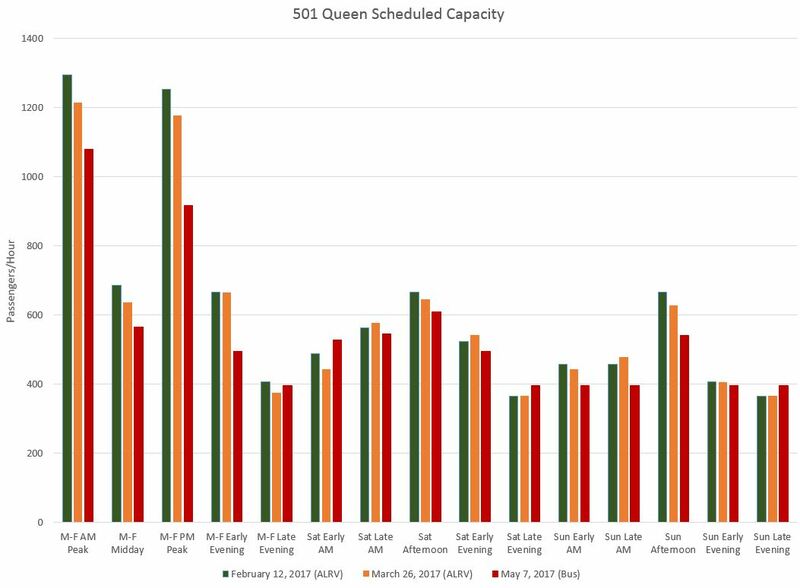 This article is a follow-up to my previous piece on 501 Queen Capacity and the staff response to a query at the TTC Board Meeting of June 15, 2017. 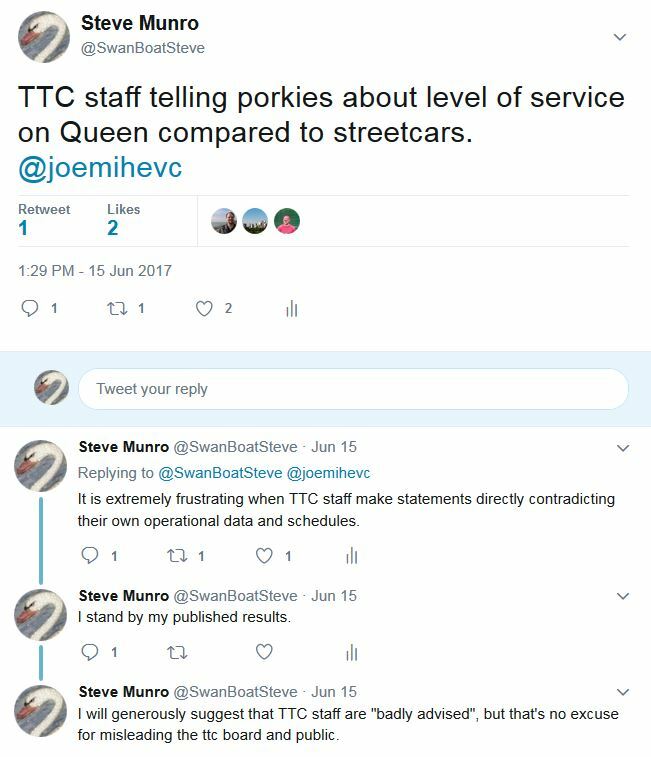 At that meeting, Commissioner Joe Mihevc asked whether the capacity operated by buses on Queen Street was the same at all hours as the streetcars that had been replaced. Staff, after a bit of hesitation, replied that it was. The exchange is available on YouTube. The term “porkies” will be familiar to Andy Byford and any of his team from across the pond. I moderated this later on to suggest that staff were “badly advised”, the standard political excuse when a Minister is attempting to extricate him/herself from accusations of misleading the House. Unfortunately, the actual schedule data do not back up staff claims. In the table below, note that the vehicle capacities are taken from the TTC’s Crowding Standards. In almost all cases, and certainly during all periods when the route is busiest, the scheduled capacity of bus service is less than that of the streetcar service. An explanation of the February to March change in streetcar capacity is in order here. For the March schedules, the TTC planned on a service diversion that did not actually take place. Because they have no spare cars, they make up the extra running time by stretching the headway between vehicles thereby reducing the line’s scheduled capacity. In some off=peak periods, spare vehicles are added to compensate, but not during the peaks. 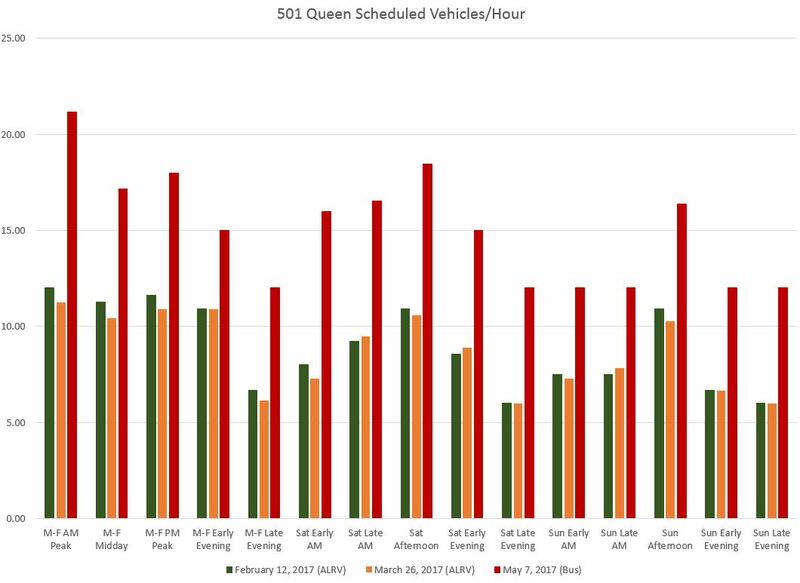 On a vehicles/hour basis, the buses come much more often than the streetcars because more of them are needed to provide the same service. If the buses can maintain an even spacing (which they don’t as demonstrated in my previous analyses), the shorter wait time contributes to riders’ impressions of better service when in fact there is less capacity on the route. 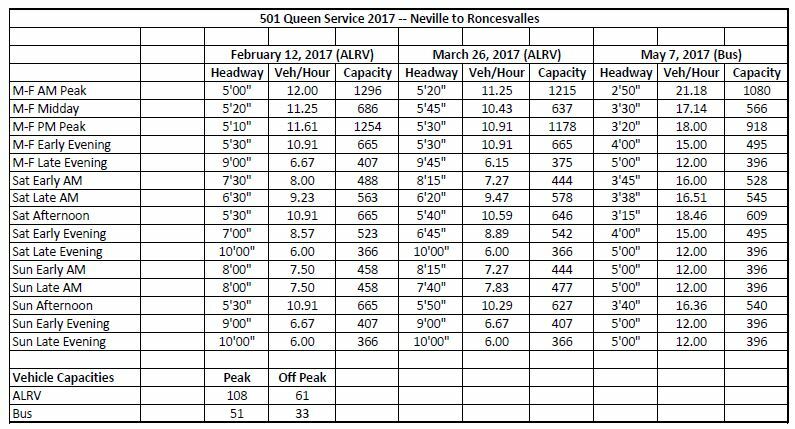 The one caveat I will make with respect to scheduled capacity is that the TTC is chronically unable to run ALRVs where they are scheduled. This has been a long-standing problem going back to well before any issues with vehicle shortages. Service Planning schedules a capacity based on larger cars, while Operations sends out shorter ones that are overloaded. This is no excuse for perpetuating the under-capacity situation with the replacement bus service. In coming weeks, some of the currently surplus running time in the bus schedules will be eaten up by construction on Queen west of Spadina, and on Lake Shore west of Humber Loop. The surfeit of vehicles we now see on Queen at its terminals and salted away in places like Wolseley Loop will likely vanish. We will review, we just don’t have time today. The charts above are intended to detail my claim that the scheduled service has declined based on the TTC’s own schedules to save TTC staff the difficult work of looking this up themselves. As for the actual capacity provided on the street, there are charts covering the peak periods in my earlier article. These are based on TTC vehicle tracking data and reflect the actual mix of vehicles and headways on a day-to-day basis. When a reply arrives from the TTC, I will update this article. After Thursday’s TSO concert, I walked up; to Queen to catch a westbound 501L home. No buses visible in either direction (and none passed while I was walking north with a view of Queen). After about 10 minutes, three buses arrived in a nose-to-tail convoy eastbound. The first bus had standees, the second bus had some seated passengers, and the third bus was essentially empty. Obviously the empty bus wasn’t contributing any meaningful capacity to the route. It could have passed the buses ahead and taken some load off, but obviously it hadn’t, and wasn’t going to. After a couple more eastbound buses, a lone westbound 501L showed up with a crush load. Since no other buses were in sight and a (notional) 501P would not work for me, I squeezed on at the back (having a Metropass helps). We were lucky that someone wanted to get off at this stop: the bus didn’t stop to pick up waiting passengers at (at least) a couple of stops (I noted Soho and Augusta) because no one wanted to get off at those. When the people waiting were picked up, I don’t know. As we went westbound, we encountered a number of eastbound twin and triplet buses. This is at 10:30 PM! I will also note that an Orion VII at full standing cannot satisfactorily handle a route with significant turnover at most stops. The front wheelwells and single-stream exit doors (with inevitably at least two riders using the exit space as a standy-stall) make getting off or on a protracted struggle. That’s compared to CLRVs and ALRVs at similar full-standing or crush loads — at least there is some space to get on and squeeze further from the doors. Yes, the capacity claims are porkier than Porky Pig!